These days, everyone seems to snap candid photos with their mobile phone, and the pocket sized do-everything devices threaten to replace point-and-shoots entirely. I wrote some tips for using camera phones back when they were just starting to get popular, but the technology has improved a lot in the last four years. This week, let's take a fresh look at how to get the best photos with your phone. Even though some cell phones now offer as many megapixels as traditional point-and-shoot cameras (see "Sony Ericsson, Samsung Duke It Out for Megapixel Supremacy" for evidence), not every scene is a great choice for your camera phone. I see a lot of people trying to take pictures of the stage at concerts, for example. I'm sad to say that pretty much all they will get is a dark frame with a blur of bright light in the middle. Camera phones might have improved in the last few years, but you'll still get the best results when you shoot stationary or slow-moving subjects in well-lit locations. Does that mean you shouldn't bother trying to take pictures in dark rooms or at that rock show? Of course not--there's no extra expense, and you're carrying your phone around anyway. Take lots of pictures; just don't expect miracles. Have you noticed that you get more blurry photos with your camera phone than with your usual camera? It's not your imagination. The shutter speed is slower, and you very likely have no ability to vary the exposure settings. So for best results, you'll want to take a deep breath and then let out a slow, steady exhale as you gently trigger the phone's shutter release. Hold the phone as still as you can, with both hands if possible. It's not hard, but it does take some practice. Another key to getting sharp photos: Get to know the camera's shutter release. How long does it take for the picture to get taken after you press the button? If there's a lag, you'll need to account for that. And if the shutter release is on a touch screen (such as on the Apple iPhone), the shutter probably gets tripped after you lift your finger, not when you press down. Either way, be sure to hold the camera steady while the picture is actually being exposed. Your camera phone probably has a few settings you can use to optimize your exposures. All the same rules apply that you know from using your digital camera. If there's an ISO setting, take it off Auto. When you're outdoors in daylight, set the ISO to its lowest value to minimize the digital noise in your picture (which can be pretty bad with a camera phone). In lower light settings, bump the ISO up as high as it'll go. Check out "Use ISO to Take Low-Light Photos" for ISO advice, and if you end up with a lot of noise in your photos, you can try some of the suggestions in "Eliminate Noise From Your Photos." Likewise, you might have some control over the JPEG image quality. Always go for the lowest compression/best quality option available. After all, camera phone pictures are starting at something of a disadvantage to begin with; don't compound the problem with lots of photo-damaging compression. Your photo editing program--whether it's Adobe Photoshop Elements, Corel Paint Shop Pro, or even something like Microsoft's free Windows Live Photo Gallery--can help improve many camera phone photos. Photo fx costs $3, so you know it's not going to replace Photoshop, but it offers an impressive collection of filters and effects for beautifying your photos, all right from the screen of your iPhone. It's available from iTunes, so you'll need to have that program installed before you can download the software. Tiltshift turns your photos into faux miniatures (sort of like the images I told you about in "Turn Real Life into a Miniature"). The $3 program is available from iTunes. I just love QuadCamera, a $2 app (also available from iTunes) that combines a sequence of photos taken in quick succession into a variety of layouts. It's cooler than it sounds. Valerie says that she took this photo of a fireworks display on New Year's Eve from her apartment window, overlooking Central Park. 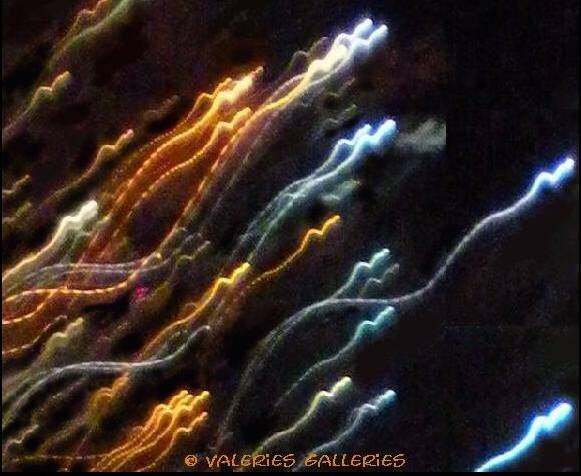 Matt writes: "I shot this photo with my Canon 40D during the yearly Hot Air Balloon Festival in Panguitch, Utah. 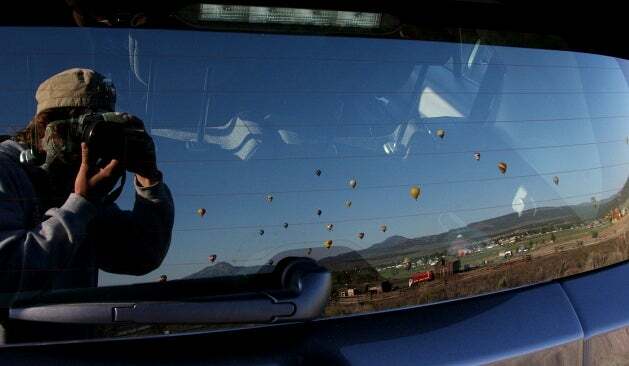 I happened to be walking around my car when I noticed the reflection was really clear on the back window." To see last month's winners, visit our slide show. See all the Hot Pic of the Week photos online.